This configuration, sometimes referred to as a "shoebox on the wall" is the least expensive option of the three major types. It features a basic frequency inverter connected between the line and the load. Speed control is generally operator initiated either through a front panel keypad or speed potentiometer. Functionality and features on this type of frequency inverter are generally limited. It should be noted that an external disconnect is required and that this type of frequency inverter may not be suitable for filter room applications due to the harsh environment and the lack of a secondary enclosure. 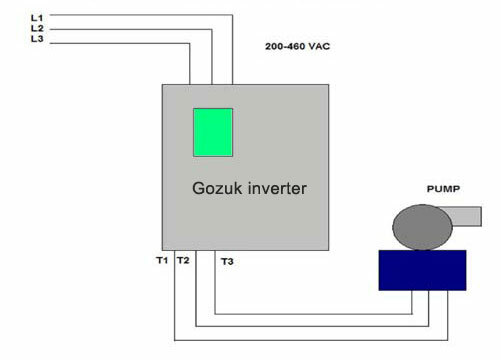 One major issue with this type of frequency inverter is that being the sole load driving component, a failure of the frequency inverter will bring the entire system down until the frequency inverter is removed from service for repair or replacement. This configuration is a step up from basic "shoe box". 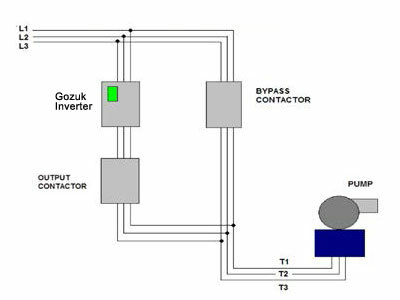 It generally features a secondary enclosure (NEMA 1 or 12) with additional control circuitry and (2) contactors which can bypass frequency inverter circuitry allowing manual control of load through conventional across the line motor starter control in many cases. It should be noted that while the output sections of the frequency inverter are isolated from the load, the frequency inverter input sections are not and that failure of input section components may still prevent manual system operation. This type of frequency inverter may or may not include a service disconnect and additional load protection. 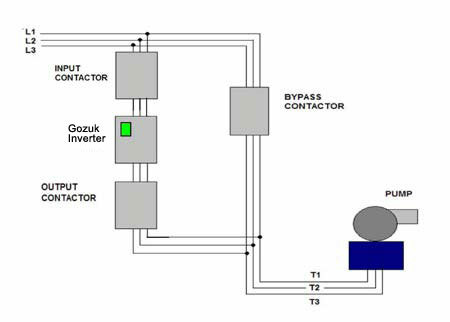 A three contactor bypass features a secondary enclosure (NEMA 1 or 12), additional control circuitry and (3) contactors which in bypass mode completely isolate the frequency inverter unit ensuring functionality in case of frequency inverter failure. In addition, virtually all of this type of unit feature a code compliant service disconnects and "rapid trip" input circuit breaker which affords the frequency inverter substantial protection in the event of power surges and lightning strikes.